Every WordPress theme comes pre-set with a default menu that is, usually, based on how you structure your pages. Some have drop-downs to show secondary pages (children) but some only show top-level pages. With the advent of WordPress 3, you can now create a custom menu where you add or delete pages from the primary navigation at will. Or you can create a custom menu that you use somewhere else. Here’s how. Give the new menu a name. Don’t sweat the name, you can rename it later. Once you have created the menu, you can add links. If you do not see all of these options, click “Screen Options” in the upper right hand corner of the Dashboard screen. Then enable them by ticking the select boxes. Screen options may need to be updated to view all menu types. 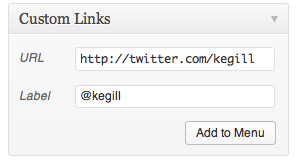 Example of a custom link in a custom WordPress menu. As soon as you click “Add to Menu”, this link will appear in your new menu window. WordPress defaults to showing you the most recent posts but you can view all or search. Select any post that you want in the menu and click “Add to Menu”. Or skip this section. 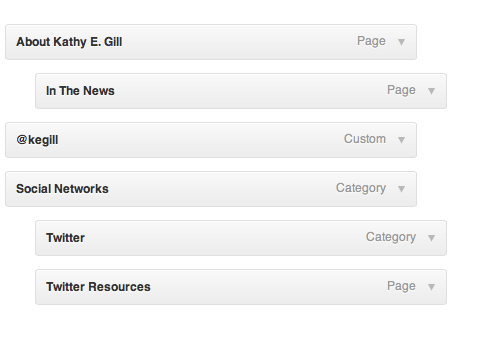 WordPress creates an archive page for categories and tags. Use either of these tools to add specific blog content types to the menu. Remember to click “Add to Menu” after you’ve made your selection. Once you have all of the links that you want in your menu, now’s the time to arrange them. You’ll do this by click-and-drag. Suggestion: if there is no obvious order, such as sequential steps, consider putting the items in alphabetical order. To create parent-child relationships, just drag. A nudge to the right makes a link the child of the link above it. Arrange the menu items by click-and-drag. Nudge to the right to nest links. Don’t like the default link title? Click the “down arrow” to reveal an edit window. That’s also how you remove a link from the custom menu. If your theme allows it (and most modern ones do), you can replace the default primary navigation created by the theme with this new menu you’ve created. Use the new menu to replace the default one. Some themes support more than one custom menu. 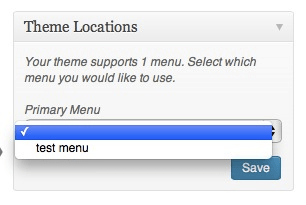 You can see themes that support custom menus at WordPress.com or search for themes at WordPress.org. Learn more with this step-by-step from WordPress.com and from the WordPress codex.